Tamilian tiffin items… ah, so much charm in these old-school eateries no? We love, love and love visiting Mylapore for its mamis and mamas serving us quick hot, traditional food. Some of these place have been around for decades and the fact that the pricing is just as it was since the good old days leaves us loving each eatery just as more as the next. Starting off as a shop selling newspaper in the 1920s, the kutti kadai started making news for its delicious rosemilk. Can’t stress enough how we’d like to swim in a pool of this. The best rosemilk we’ve ever had and a glass of it just costs INR 15. And it’s oh-so-refreshing! Read more here. Come here post 5pm for yummy bondas and bhajjis. Get a plate of three just for INR 30. The chutney that comes with this is amaze! And it’s literally served out of a hole-in-the-wall window! Read more here. Paneer is actually the Tamil term for rose water, so don’t worry it has nothing to do with cottage cheese! This fizzy drink uses rose essence, soda and sugar and comes in a cute goli bottle. Pop it and sip away to quench your thirst. While you can get it most local shops we love this kutti shop in Mylapore for it friendly owners and evening nibbles. Get these delicious local dumplings ( both sweet and savoury) for just INR 8 a piece! Mami’s Tiffen Stall started way back in 1959 but still serves amazing local food like dosas, uttapams and idlis and of course, filter coffee, super quick. And the best part? They’re all under INR 50. Read more here. An iconic tiny eatery that’s pretty much a hole in the wall. Don’t be fooled by its Spartan ambience, it’s apparently seen many stars come by especially for traditional brekkie. We tried the adda (INR 40) and filter kaapi (INR 30) here and were content. You even get jalebis, idlies and pongal as part of their small menu. Slightly more “upscale” when compared to the other old-world places on this list, Ratna Café is still legendary. You’ll be going a tad bit over budget, but hey it’s not too much. 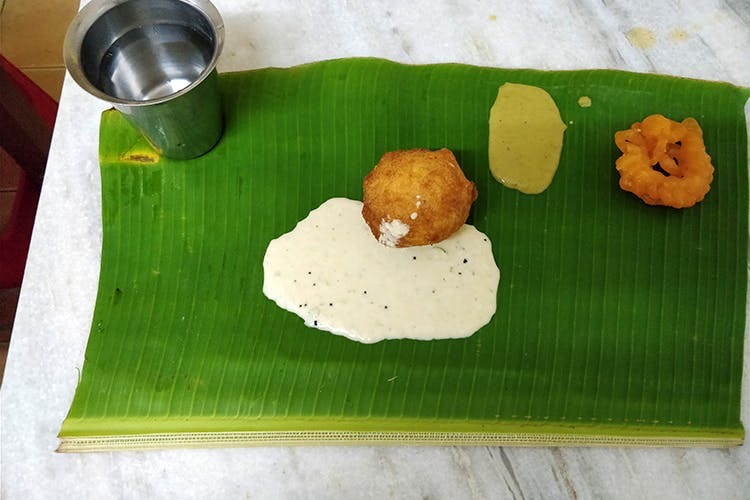 You get sambhar idli for INR 55, medu vada for INR 40, curd vadai for INR 53 and dosas start at INR 70 ( we absolutely love the Ghee Roast here with divine vengayam thakkali chutney) but hey there’s always a tumbler of filter kaapi for INR 40. Been around since the 50s, this mess is also a slightly upgraded version of its former self. But the vadais here are still quite special; have the keerai vadai (with spinach) for INR 45 and wash it down with a nice soodu cup of kaapi. We haven’t tried the other dishes here ( a little over INR 50) but apparently they’re very hush-hush about their old-school recipes. Care to try?